We are truly proud to continue to be the People's Choice for Funeral and Cremation Services! 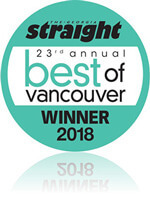 We thank you for voting us the Best of Vancouver's winner (Best Funeral Home category) for our seventh consecutive year. Thank you, Vancouver! Amherst is truly honoured to have received your vote of confidence once again. 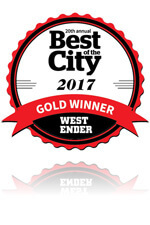 We're proud to keep the Gold Winner Award (Best Funeral Home) for another year! Amherst Funeral & Cremation Services is fully licensed by Consumer Protection BC. Learn more about what CPBC does for you. Amherst is the leader in providing simple, affordable and dignified funeral, cremation, burial and memorial services. Our award-winning services have continued to become the gold standard for respectful care for both the departed and the surviving family (please read testimonials from families we served). Amherst is fully licensed and experienced to provide a full range of services any traditional funeral home has to offer. We serve entire Lower Mainland: from Hope to West Vancouver. Our mission is to bring you simple, easy-to-understand and comprehensive cremation, burial and funeral service packages with up-front pricing, no hidden-fees, no hassle, and no sales pressure. We honour Memorial Society Memberships: we serve all members of any memorial society or funeral co-op, honouring prices currently in effect for those members (Although honestly, our current prices are lower than theirs). We work with you to bring you just the service you want: no more, no less. We respectfully guide, assist and provide you with cost-saving options in every step of the final arrangements. Amherst's funeral, cremation, burial and memorial service packages include value-added benefits that other funeral homes and providers charge over and above our standard prices. Unlike what most are led to believe, you DO have options. We simply believe that funeral, cremation and burial costs need not be overly complicated and financially draining, especially at moments of grief. Wherever you are in lower mainland, you have the chance to bring our Award-winning services right to your doorstep: We do come to you for arrangements and for most return deliveries. Our convenient online arrangements are also available 24/7. Amherst Cremation: Offering the Best Memorial, Cremation and Funeral Home Service in Vancouver and all Lower Mainland.